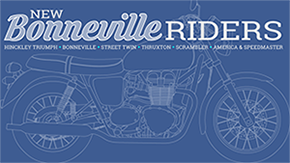 Attention all Bonneville enthusiasts and owners! Here is an amazing opportunity for you to be exposed to an important aspect of Triumph motorcycle history in the USA, and more specifically in Illinois. I myself did not know this until last year when I was exposed to flat track racing by Bill Gately of Bonneville Performance. Flat track racing is a uniquely American sport that developed when us crazy Americans got the idea of racing our vintage motorcycles around pre-existing flat oval horse racing tracks that of course are paved with… DIRT! It was so much fun that it caught on big time especially in the South where there were lots of horse racing tracks! Well, as time went on flat track racing got faster and more sophisticated, reaching increasingly larger audiences. In the 50’s and 60’s it reached a peak for Triumph when guys like Gary Nixon won national championships riding on flat track modified Bonneville’s! Sadly, Triumph faded into the dirt metaphorically after those peak years as the brand languished globally. 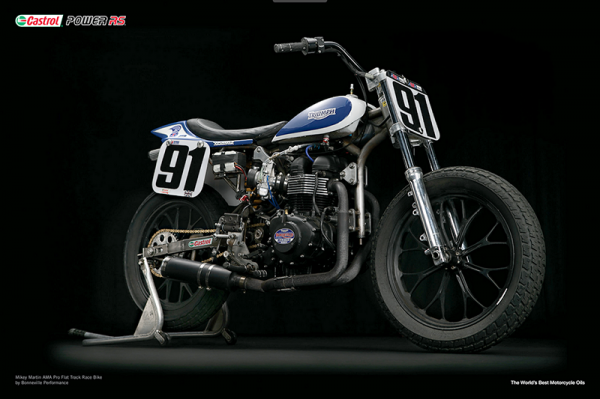 A few years ago Bill Gately of Bonneville Performance brought Triumph back into official AMA Pro Flat Track racing by starting a factory sponsored pro team. Bill builds an amazing super tracker out of a modified Bonneville 270 degree engine, building his own frames, engine modifications, racing carbs, suspension, exhaust – you name it! These super trackers have 995cc of pure horsepower and torque that reach 130+ MPH on these dirt flat tracks! Castrol Ad featuring the Bonneville Performance Super Tracker ridden by Mikey Martin #91. 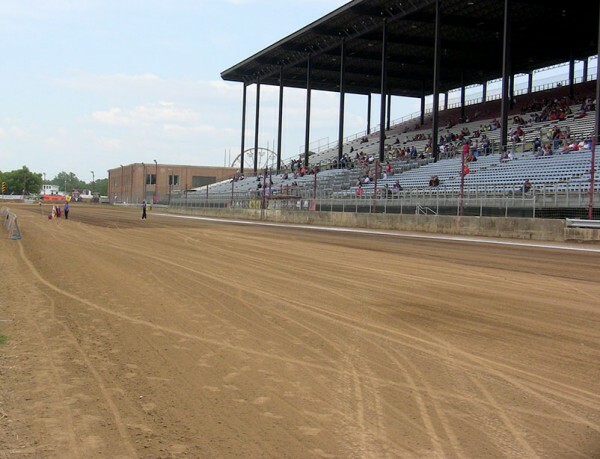 Little did I know that one of the most well-known historic flat track races takes place right here in Illinois at the Illinois State Fairgrounds… and it’s called the Springfield Mile. At one point in flat track racing history, from 1946 to 1953, the AMA Grand National Champion was decided based on the results of this single race! The Springfield Mile takes place this year on Sunday, May 25th (Memorial Day weekend). 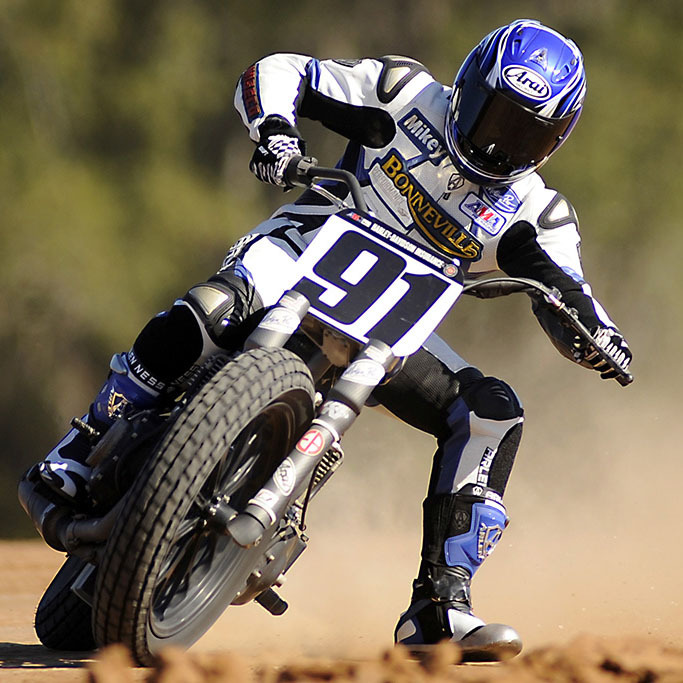 The Triumph AMA Pro Flat Track Teams are going to be making an appearance in Chicago on Friday, May 23rd at Motoworks Chicago! Johnny Scheff is hosting the teams and will also be leading a group from Chicago to ride down to Springfield on Saturday, then staying on into Sunday to watch the Springfield Mile race. Yours truly will be joining them! Here’s a link to Johnny’s post about the Motoworks Chicago weekend. On Sunday I will be joining Bill Gately and the Bonneville Performance team in the pit area helping out as I did last year. 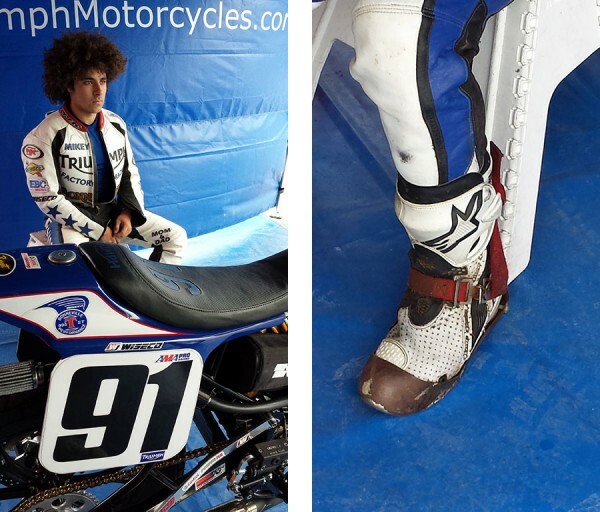 Our rider is Mikey Martin #91, who will be racing again after an unfortunate accident in the first official race of the season at Daytona, that resulted in a broken ankle. Mikey’s ankle is healed and he’s ready to go! The Latus Motor team lead by Joe Kopp will be competing as well on a Bonneville Performance super tracker with their rider Shayna Texter #25A. If you have never experienced this type of racing (like me before last year), I urge you to give it a try. It’s some of the most exciting motorcycle racing you can ever witness! The gathering at Motoworks Chicago included many regular customers and some new faces. Mickey Martin and Shayna Texter were on hand to sign autographs as well as the two team owner/managers, Bill Gately and Joe Kopp. It was good to meet the team again having not seen them since last year. Steve and Jim Gately are assisting again this year as crew members. The bikes looked great, with some subtle little tweaks and changes that I noticed. Steve filled me in on a few of the not so obvious ones. The race on Sunday should prove to be very interesting!